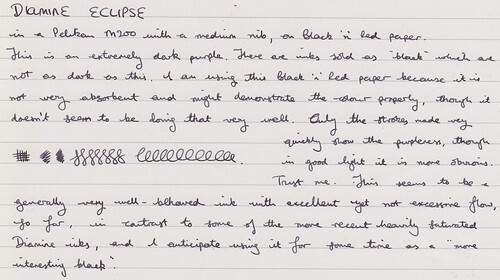 I really like the look of Eclipse – any thoughts on its feathering on different paper? It seems quite well balanced – it doesn’t feather horribly on anything that I’ve tried, even with broad nibs, but it isn’t dry. On the other hand, I find Poussiere de Lune quite well behaved too, so we may be using different paper. As a note, after having used it for a while, it’s even less purple than I’d thought. In good light you can see hints of purple – in poor or mediocre light it just looks black. I had trouble distinguishing it from black a lot of the time. It’s purple in the same way as Noodlers Zhivago is green – i.e. you would not notice it casually. I find that quite a nice effect though. 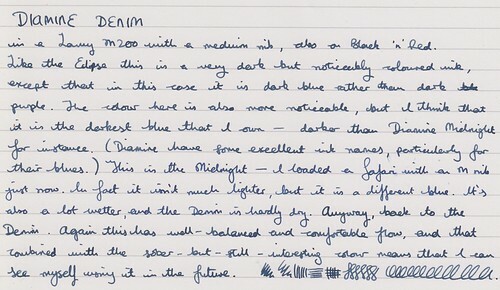 Thanks for your reply – fwiw, my Pousserie De Lune feathers on everything but Rhodia so far. I do rather like the idea of Eclipse being a “look twice” purple though – Evergreen is my equivalent for green inks.